Kootenay National Park is located in southeastern British Columbia, Canada, and is one of the four contiguous mountain parks in the Canadian Rockies; the other three being Banff National Park directly to the east, Yoho National Park directly to the north and Jasper National Park which does not share a boundary with Kootenay National Park. 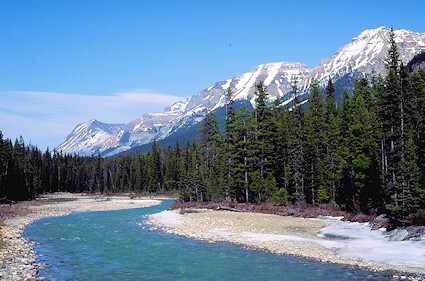 The Park covers 1,406 km2 (543 sq mi) in the Canadian Rockies and ranges in elevation from 918 m (3,012 ft) at the south-west park entrance to 3,424 m (11,234 ft) at Deltaform Mountain. Four of Canada's five Rocky Mountain National Parks (along with bordering provincial parks) are designated as an UNESCO World Heritage Site. 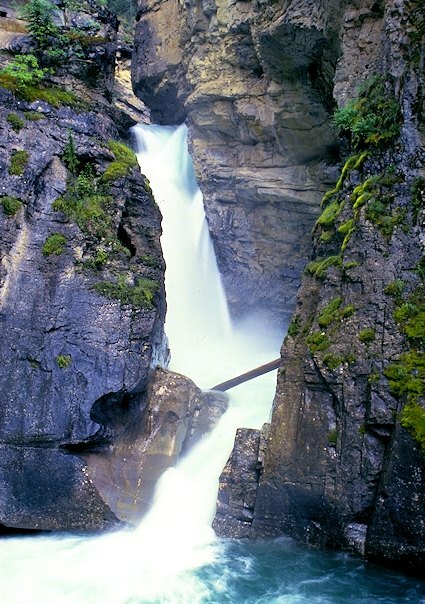 One of these Canadian gems is Kootenay National Park located on the west side of the Continental Divide. The diversity of Kootenay ranges from towering snow covered mountains to grasslands. History tells us the first nations people known as the Kootenai lived in this area long before the fur traders and explorers arrived in the mid 1800’s. The homesteaders and businessmen who saw the potential of the region (mainly the hot springs) followed them. In 1910 Robert Bruce, a businessman from Invermere, BC first contacted the Canadian government suggesting that a road be constructed across Vermillion Pass joining BC and Alberta. Construction was started in 1911 but was put on hold when World War 1 broke out. In 1919 a federal-provincial agreement was reached, which started the groundwork for Kootenay National Park. The park was established in 1920 and now takes in an area of more than 1,400 square km (540 square mi.) attracting visitors from far and wide. The park's main attractions include the Hot Springs, Olive Lake, Marble Canyon, Sinclair Canyon and the Paint Pots. The hot springs offer a hot springs pool ranging from 35°C to 47°C (95°F to 117 °F). The Paint Pots are a group of iron-rich cold mineral springs which bubble up through several small pools and stain the earth a dark red-orange colour. The Paint Pots were a major source of the Ochre paint pigment for a number of First Nations groups prior to the 20th century. Because of the relatively small width of the park (five miles on each side of the highway), many of the park's attractions are situated near the road and are wheelchair accessible. Highway 93 South also known as the Banff-Windermere Highway was the first to take cars across the Rockies, and today is travelled by more than 3 million vehicles a year. The Kootenay Parkway was open in 1923. 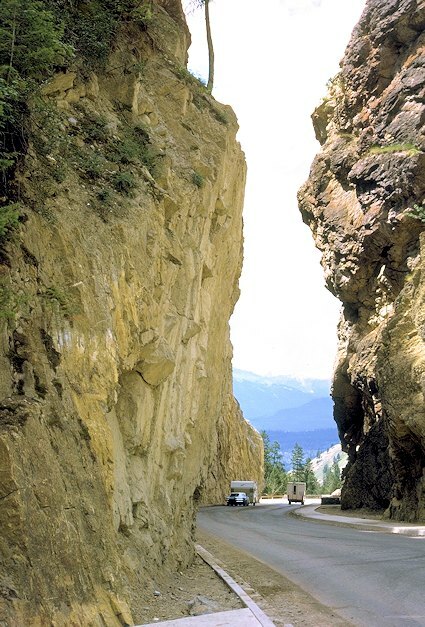 This popular roadway is the only road through the Park, joining the Trans Canada Highway with the Columbia Valley. Spectacular mountain scenery and canyons, abundant wildlife and hot springs are all part of a Kootenay National Park experience. Vacationers driving along the Kootenay Parkway can enjoy the numerous sites as they are near the highway. These include sites such as the Marble Canyon, the Paint Pots, and the Redwall Fault. And at the southern end of the park is famous Radium Hot Springs. Majestic scenery is around every corner of the highway, starting in the northeast corner with the towering peaks of the Rockies to the more gentle slopes in the southern area of the Columbia Valley. Moose, elk, deer, bighorn sheep, mountain goats and black bears can often be seen along the roadway, while the backcountry is home to grizzly bears and wolves. Hiking and backpacking are very popular in Kootenay National Park. Within the park boundaries are more than 200 km (120 mi.) of trails, they vary from full day hikes and overnight treks to short interpretive walks. Kootenay attracts many people that like to go mountaineering and climbing along the ridges and into the remote wilds of the park. There are 11 picnic sites in the park, including one winter camping site. You can go fishing and swimming. Boating, canoeing and rafting are all favorite outdoor activities. Horseback riding is permitted on designated trails and there are horseback rental facilities within the park. During the winter you can enjoy cross-country skiing and snowshoeing, but trails are not groomed and some are trails are for ski mountaineering only. The Radium Hot Springs situated at the junction of the Kootenay Parkway and Highway 95/93 receives thousands and thousands of visitors every year. It’s one of the parks hot spots. The complex is open year round and consists of two pools – a hot soaking pool and a cool swimming pool. Just outside the south end of the park is the village of Radium Hot Springs with visitor information, motels, hotels and restaurants. From majestic snow covered Rocky Mountains and the Continental Divide to the gentle slopes and grassy Columbia Valley, Kootenay National Park is a kaleidoscope of diversity and changing scenery.